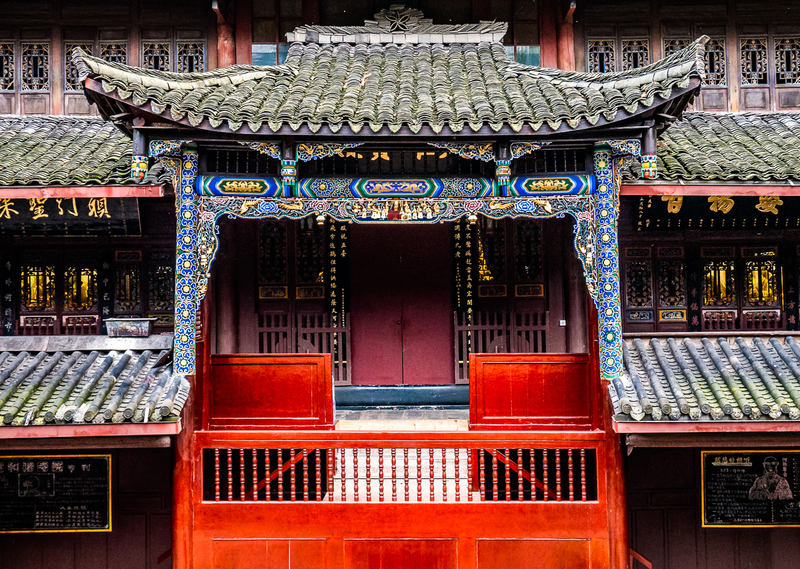 The entrance to the main meditation hall of a small Buddhist monastery on Emei Mountain. Emei Shan, or Emei Mountain, was an unexpected highlight of the three-week tour I recently did in China with Intrepid Travel. I knew we’d be staying in Buddhist monasteries, and that we’d be hiking into one of them, but I was not prepared for the beauty of the place, or that I’d be so moved by the whole experience. I’ll write about it in more detail later (I want to finish all my stories about Japan first) but meanwhile here’s a short piece I wrote for Intrepid. Hop on over and have a look. Climbing the mountain – lush forests and beautiful views. Next post: Getting the perfect shot at Fushimi Inari Shrine – the tunnel of red tori gates! And more of the highlights of Kyoto. Very moving experience. China has indeed lots of unexpected treasures. I was surprised by how moved I was at Emei Shan. Everything about the Emei experience was unexpected. I’d read a little about it, but had no idea it would affect me so deeply. Thanks Jo. I bet you’re pretty busy right now too. May you get your internet issues sorted! Yes, it really was. I’m so glad we went there. Love how steep these mountain flanks are… and yet look at them, all covered in thick forest. The mountain is quite amazing – steep sides, and high! Thick rich forest all over, hoards of macaques ( and no doubt other wildlife) and yet the summit is 3099 metres. Also I remember feeling the altitude in South America at 2500 metres but didn’t feel it at all at Emei. Yes, it really was. I’d love to have had more time there. That opening shot is amazing, Alison! I love the vibrant colors and the details. 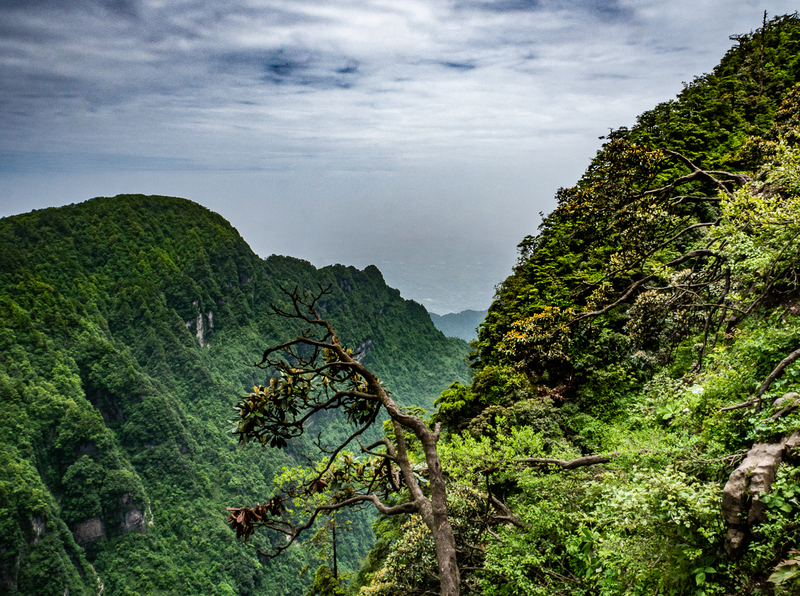 Can’t wait to see more photos and read your stories on Emei Shan in the upcoming posts! Thanks so much Bama. That monastery that we hiked into was so lovely – old and worn in a good way because of the care with which it was originally built, with most of the colourful trim freshly painted. It had obviously been originally built for a much larger contingent to monks. I loved the feeling of it. Eventually I’ll get to writing my own posts about it. What an incredible experience! One of many you had on this trip. Aren’t you glad you went? I look forward to more. I am *so* glad I went! And yes, it was a truly incredible experience. I kind of had a feeling that Emei would be special, and it really was. Thanks Hedy, and you’re welcome! The whole place was special – the mountain and both monasteries. I wish we’d had more time there. Smiles for you from a bright sunny day in Van. It was absolutely gorgeous Curt – both the mountain and the monasteries. The photo of the meditation room in the small monastery wasn’t included this time, but I’ll put it in when I eventually do a post about it – it was really beautiful. And yes, both monasteries perfect places to meditate. Although I’d heard of Emei Shan while growing up, and seen a couple of photos of the mountain and its monasteries, I never paid much attention to it. But now you’ve showed me just how wondrous it really is. Reading your account for Intrepid especially struck a chord as Bama and I have just returned from Bhutan. The great majority of people there are Buddhists and you really get a sense of their devotion inside their temples and monasteries, which are always so peaceful and beautifully decorated – I could barely believe the extraordinary detail and exquisite colors we found inside the meditation halls. You would adore Bhutan, Alison… it is quite unlike any other nation in the world! Emei is really special. I didn’t know much about it and I really had no idea that it would affect me so deeply. From what I know of Bhutan I do think I’d love it there. One day maybe I’ll get there . . . . .
Nice article, Alison. This is how I felt all over Tibet and why I had to go back a few years later (and why I’d like to go again!). Thanks Lexie. I had no idea Emei would affect me so deeply. And I’d love to go to Tibet – I imagine it would be the same for me. I am always undone by the energy of devotion. Thank you Alison for introducing us to Emei Shan. China remains a blindspot for us as we have been circumnavigating Asia for a few years but have not been lured there. Perhaps it is a combination of displeasure for the attitudes displayed by Chinese tourists pretty much anywhere we go, showing blatant disregard for local culture or inhabitants. But of course this is at a micro level. At a macro level, it is a matter of observing the Chinese governments geopolitics first hand in South East and South West Asia that has kept us from visiting China. Of course we understand that local culture and opportunities for person to person contact invariably takes over…. I totally get your displeasure with Chinese tourists. They are much the same in their own country – loud and pushy, though of course in one-to-one situations they are quite lovely. I had some very sweet encounters, and also saw some not so cool behaviour. Of course maybe it was exaggerated for me because I’d just come from Japan where people are so reserved and polite. The difference was marked! There’s another Intrepid article to come about a rural area in the south that was gorgeous (where all the karst mountains are), and when I get to writing posts for myself about China I’ll go into much more detail. I want to finish stories about Japan first. This trip was so rich in sights and experience , it’s taking me a while to unpack it all. Isn’t it extraordinary how one can be moved to tears in these sacred places? How it overwhelms you? It happened to me just a few weeks ago in Strasbourg Cathedral (despite the crowds around me). Wonderful article Alison. I’m especially drawn to the photo of the creek with the little pagoda and arched bridges. Looking forward to seeing more. On a different subject, I’m assuming that for China it’s best to go on a tour? I’ve heard from many that it’s a challenging place to travel independently. Thanks so much Caroline. I seem to always fall apart in long-standing places of deep devotion. I remember one of the very few Bhrama Hindu temples in Pushkar, India, and also many Buddhist temples in SE Asia, and a couple of temples in Myanmar. It has not happened to me in any church – perhaps I’ve not been open to it. I seem to feel the devotion very strongly and am deeply moved by it. China is definitely a difficult place to travel independently. People will be helpful if you can find a way to translate. One story – a woman got lost and couldn’t find her way back to her driver so phoned her guesthouse person. Of course she couldn’t tell them where she was so she handed the phone to a passerby – who could explain where she was. There’s always a way, but be prepared to spend a significant amount of time simply finding your way around. That’s a strategy we use a lot here in Sri Lanka and elsewhere ~ hanging the phone to a local to give directions or an address. It works like a charm! Yes, it’s a great idea. So simple. And obvious really, though I’d not thought of it before. you’re inspired by my adventure. I felt the emotion and serenity in each word I read Alison. I would love to visit Emei Shan. I wish I could escape the madness in this country and hop a plane now. This seems like a place where one could spend several days. Your photos just seem to keep getting better…stunning. Thank you so much LuAnn! It was a really special place that’s for sure. I’m glad I managed to convey some of that. I do wish I’d had more time there. I’ll write about it in more detail when I cover it for my own blog. I hope you get there one day! I hope I get there as well. Until then I will live it through you vicariously. I look forward to that blog post. Such astounding scenery. I had not heard of this place. one more for the list! It’s beautiful isn’t it? I really loved that part of the tour and wish we’d had more time there. The monkeys were a bit scary though.